You're a mean one, Arthur Jones! He proudly admits to formerly leading the American Nazi Party and now heads a group called the America First Committee. “Membership in this organization is open to any white American citizen of European, non-Jewish descent,” he said. He voted for Donald Trump but it didn't take long for that love affair to sour. 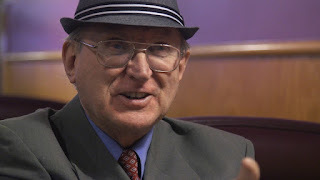 At a gathering of neo-Nazis in Pikeville, Ky., last spring, he announced he was sorry he voted for Trump, who has “surrounded himself with hordes of Jews” including his Jewish son-in-law Jared Kushner. But, barring an act of the gods, Jones will be the name on the Republican ballot for the 3rd Congressional District of Illinois. No other Republican stepped forward, and Jones gets it by default. He's a perennial candidate and has never gotten more than the Nazi base to vote for him, but he obviously likes seeing his name on the ballot. The Republican Party of the 3rd Congressional District are not liking it so much. The 3rd is one of the most Democratic in Illinois, which is saying something. So the Republicans have another Roy Moore on their hands, only worse.